NES Super Aladdin in 05:36.25 by TASeditor. 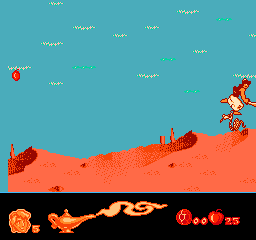 Super Aladdin is a pirated port of the Genesis version of Aladdin to the NES, containing only half the stages and loads of glitches. While this run by TASeditor appears to be slower than the previous publication, it is in fact an improvement of 2619 frames, due to the discovery of new glitches and better optimisation (read the author's comments for more details). This is because the previous publication was played on NTSC, while this TAS was played on Dendy (or a famiclone, which this game was supposed to run on), which runs at ~50.007 FPS (like PAL, but with the sound pitch of NTSC, as is usual with famiclones). To properly play back this movie in FCEUX, you need to set the region to Dendy (Config -> Region) after loading the movie, then play the movie from the beginning.